The biggest reason I hear for not becoming a foster parent is the fear of getting attached and not being able to let the dog go. I am the person who weeps over television shows, commercials, and the sad stories on our rescue page. I can’t even bear to look at the Rainbow Bridge page. I am what they so politely call in the South “sensitive,” but I can still muster the strength to be a foster parent. And if I can do it, anyone can do it. You do get attached to the fur babies that come into your house. I won’t lie. It is hard. And it’s worse the longer you have them. My first foster pug was only with me for three weeks, but I sobbed when I let him go. And I will cry over every one that comes through my home. My family all thought I would be an immediate foster failure, meaning that I would adopt the dogs I was fostering. That’s still a possibility, when the fit is right. When the right pug comes along, I’ll know it and my dogs will know it. The dogs I’ve had were not meant to stay with me and as a foster parent; you will know that, too. I have two foster pugs right now, Quincy and Isabelle. They are a bonded pair, seniors with health issues. That has kept them on the adoptable list for over six months. Quincy, a lovable bowling ball with legs, is content to sleep on my feet or next to me on the couch. Isabelle, on the other hand, is not content. She was the top dog in her old home, and she’s not in my house. Isabelle loves men, and I can’t supply her with any. Her perfect home would include a man and no other girl dogs. So as much as I love her, it’s more important that she’s happy. And the path to that happiness is away from my home. I have to be strong for her, let her go to a home that will cherish and adore her and give her more than I can. I can let her go because I have only her best interests in mind, not my need to protect my heart. This is the way I see it. Without me and all the other foster parents out there, these pugs would not be rescued. These pugs would be dumped at shelters or on the street. 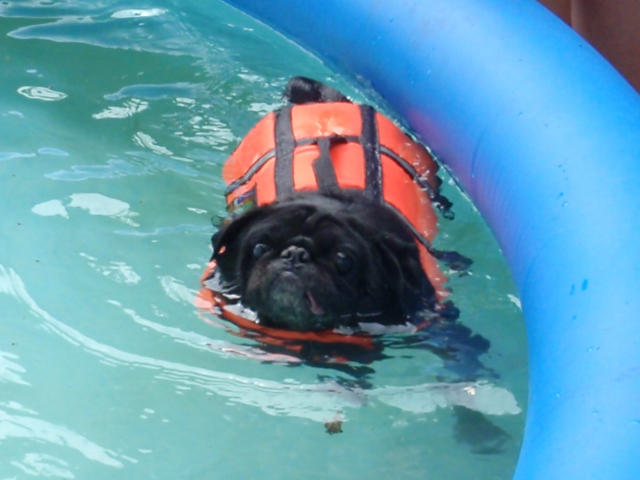 My temporary heartache and loss means that one more pug is rescued. One more pug has a safe place to live, a warm bed to sleep in, nutritious food to eat, medical care. One more pug saved from a kill shelter or a puppy mill or the streets. 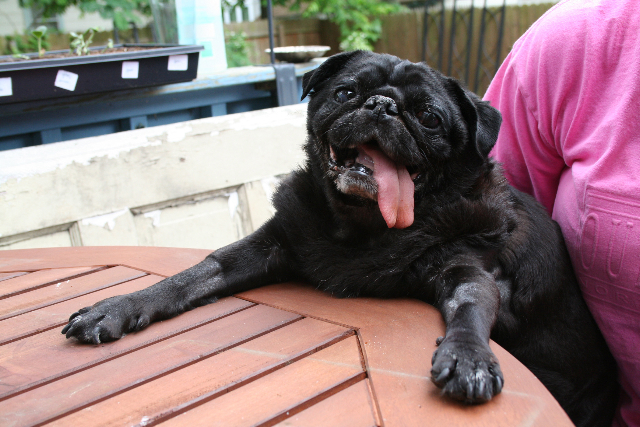 One more pug that can find the right family, the best home for their needs. One more family that is completed by a rescue pug. We know when we get a pet that they won’t be with us forever. Understanding that heartbreak in our future doesn’t stop us from getting a pet. And we love them with our whole hearts and grieve when they pass. As a foster parent, you have the opportunity to rescue these dogs from a bad situation, love them for a while, and then help them find the ideal home. The sorrow at losing them is made easier to bear by knowing that they have a new home. The unfortunate situation is, it won’t be long until you have another foster pug, and you will be focused on helping the newest member of your family. There are reasons you shouldn’t foster. Your housing situation may not allow it. Your dog may not get along with other dogs. Your family may not be supportive. You may have too many already. But don’t let your fear of getting hurt be one of those reasons. You’ve already opened your heart to a pug, open it a little more for a foster. For more information on fostering with MAPR, visit our website at http://www.midatlanticpugrescue.org/pdf/vol_foster.pdf. Those of us who have fostered a whole pack of pugs and pugs mixes over the years know that we do not always fall in love with all the pugs and pug wannabees who come into our homes. A lot of people do not understand that you can love a foster every bit as much as you would a dog you had intentionally picked out to be your companion. I know I have cared for and about all the pugs and pug mixes who have come to my home. But only a very special few have totally stolen my heart. Most of those that stole my heart were older pugs who I knew were going to be with me for a while. I must confess that it has been mostly the older pugs who have that special gentle patient nature who have most often captured my heart. A couple of persons have asked me about Aiko and when I explained that he had been with me only about 15 months because he was surrendered from a difficult home situation, there response was,”Oh well, he was just a foster.” That has really bugged me. Aiko was not “just a foster,” he was a very special old man who was wise, loving, gentle and so very patient. Aiko was the oldest pug that I ever had. He had well earned his soft bed in the patch of morning sun that he always loved. So I suppose we should lift a toast to all those older pugs who steal our hearts and make us really cry when they leave us. Mary Dike had an old pug who was a great friend of a old pug of mine who died several years ago, named Clarence. The two would pal around together and sit in the corner together like two old men nodding and commenting on the state of the world. 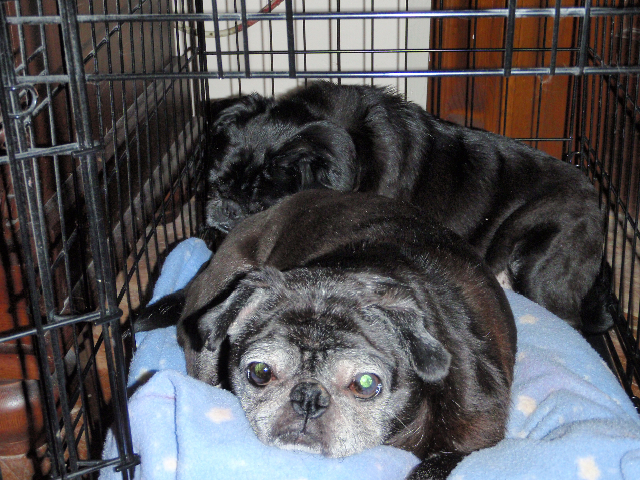 Not all seniors have the chance to hang out with other senior pugs. 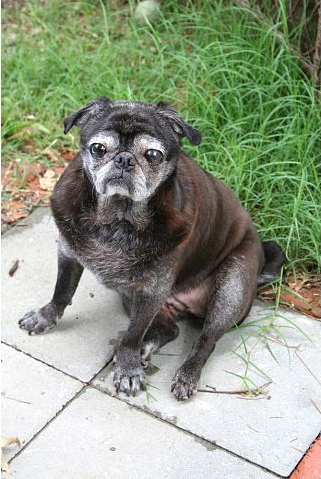 We should find ways for our senior pugs to find other seniors whose company they can enjoy. That is a gift that many would certainly enjoy.